Summer vacation is quickly wrapping up over here and we are definitely in back-to-school mode. To personalize my daughter’s gear for the new school year, I made an adorable DIY Lunchbox Charm! 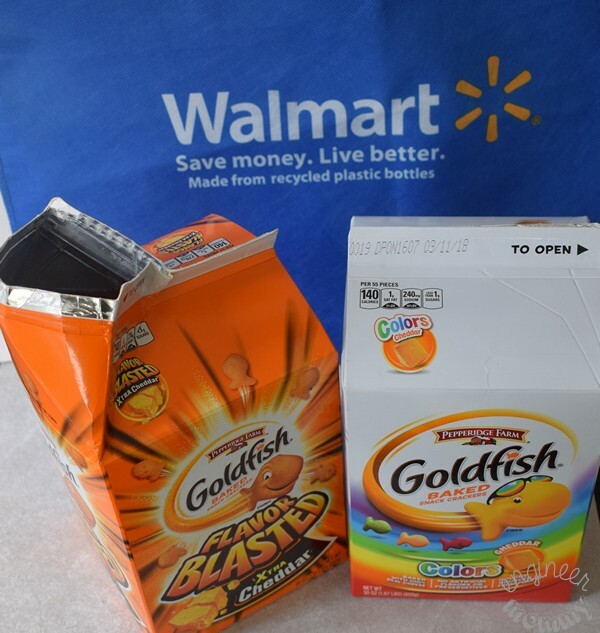 Also, I stocked up on my kids’ favorite snack from Walmart: Pepperidge Farm® Goldfish® Flavor Blasted® Xtra Cheddar Baked Snack crackers & Pepperidge Farm® Goldfish® Colors Baked Snack crackers. This September, my older daughter will be starting first grade. With that transition, there is definitely a new routine that we all must adjust to: new school bus, new teachers, new schedule, etc. That’s a lot of change for a six-year-old! While I can’t stay by my daughter’s side all day during this transition, I love that I can send her to school with something special that will surely put a smile on her face. This lunchbox charm is guaranteed to inspire a smile on her face when she takes out her lunchbox during the day. Speaking of back-to-school essentials, we always stock up on Goldfish® crackers from Walmart. Did you know that bulk carton Goldfish® crackers are currently offered at rollback pricing of $5.98? Take advantage of this fabulous price on these large boxes. Want to pick up some Goldfish® crackers for your family? Hover over the photo below to click through to Walmart.com and buy them! 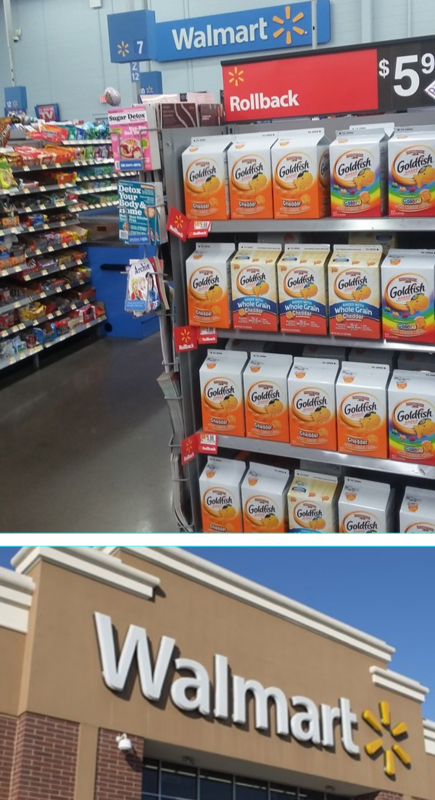 During a recent trip to Walmart, I picked up Goldfish® crackers in two varieties: Goldfish® Flavor Blasted® Xtra Cheddar Baked Snack crackers & Goldfish® Colors Baked Snack crackers. These 30 ounce boxes are a great everyday value at Walmart. While I was at Walmart, I picked up some other back-to-school essentials for my older daughter, who will be entering first grade in September. 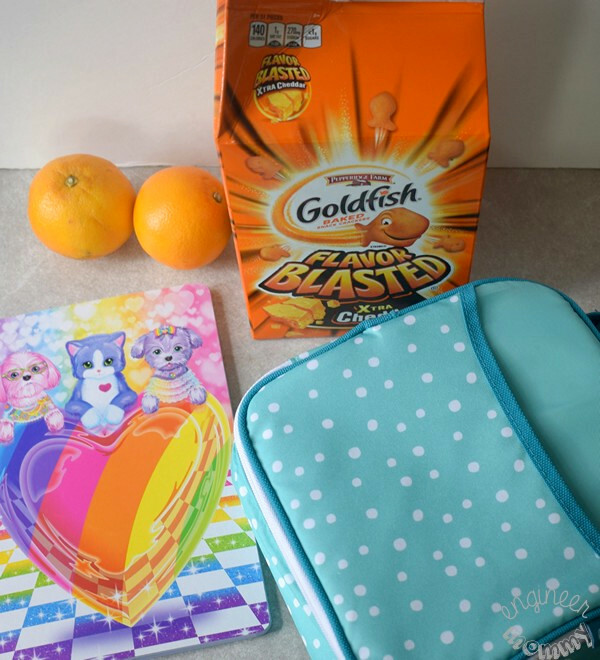 We picked up this gorgeous blue lunchbox, this adorable notebook (my daughter loves cats & dogs), Goldfish® crackers and some fresh fruit (oranges, bananas, etc. ), among other essentials. 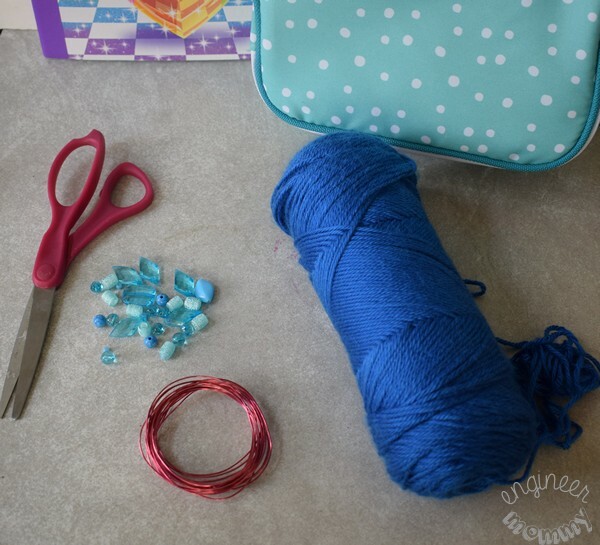 *TIP: Choose beads & yarn in a color that is complementary to your lunchbox. 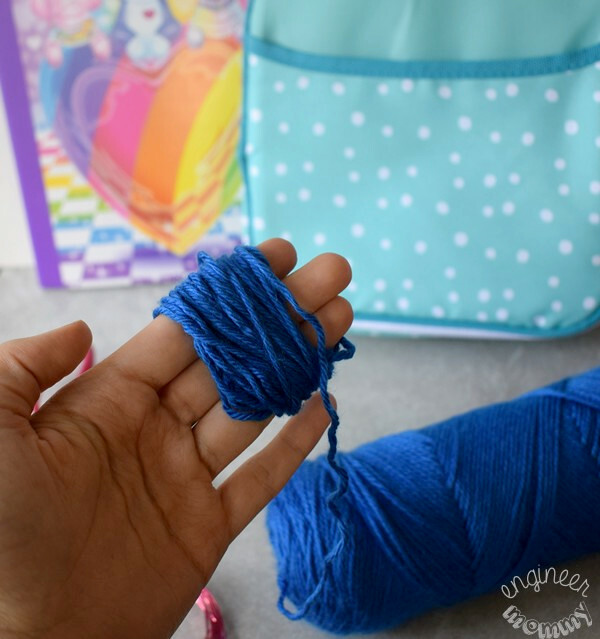 I found this blue lunchbox at Walmart and fell in love with it, so I picked up yarn & beads from Walmart in the same color family. 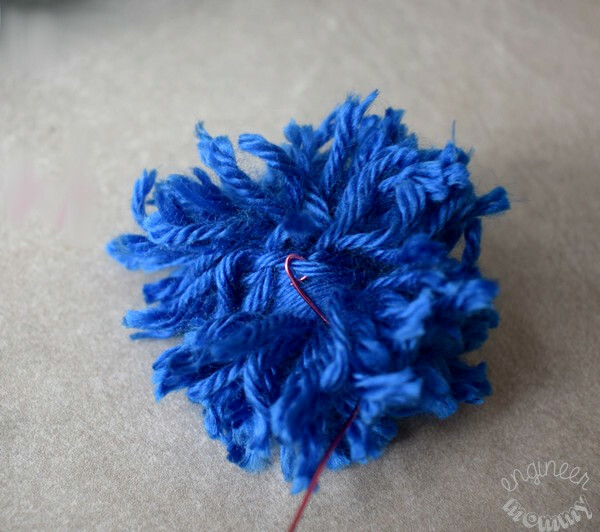 To make the pom pom, start by wrapping the yarn around a few fingers at least 15 times. Take the loose end of the yarn and wrap it around the yarn along the center in the other direction to form this bow shape. 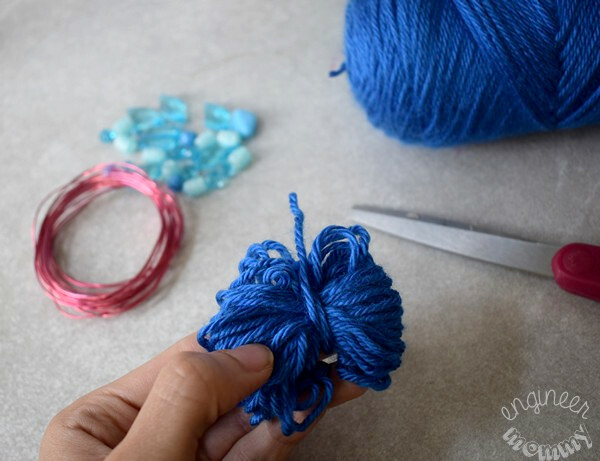 Make a knot in the yarn to keep it from unraveling. See all the loops of yarn on both sides of the bow? We will be using a pair of scissors to cut the yarn loops in the center. Voila! We have a little yarn pom pom. 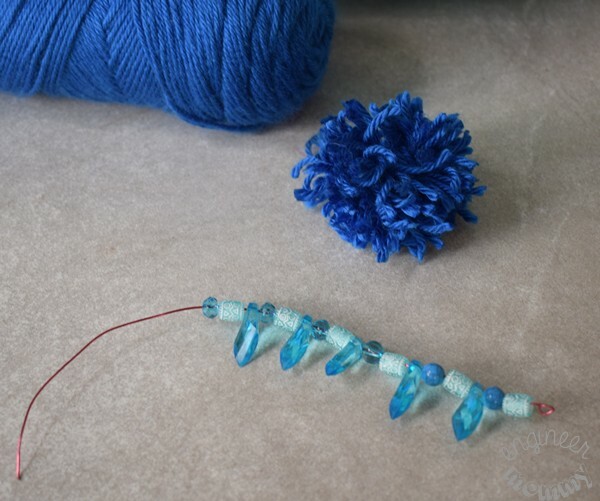 Create a little hook out of the beading wire and use that to attach the wire to the center of the pom pom. Cut the beading wire to about 9 inches. 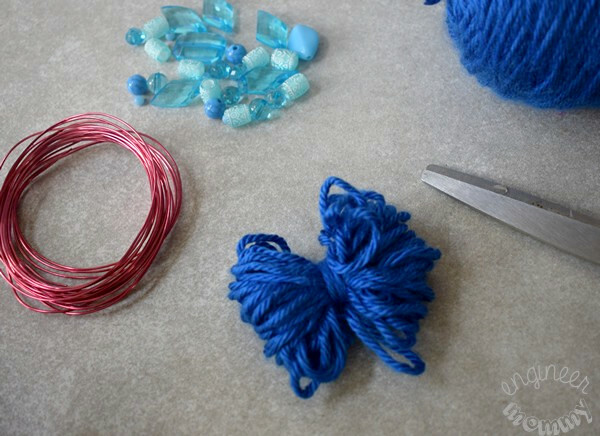 Thread the decorative beads onto the wire. I tried to create a pattern with the beads I had to make the design aesthetically pleasing. Close both ends of the wire by forming small circles. Attach one end of the wire to the lunchbox by hooking it into the zipper pull. I love the way this little charm came out! Doesn’t it add so much cuteness to this lunchbox? I love that I Was able to personalize my love for her with this lunchbox charm. I know that my daughter is already very excited about bringing her new lunchbox to the first day of school. By sending her to school with this lunchbox charm, which she helped me put together, I am definitely ‘Packing a Smile Every Day’ in her lunch! Between the school supplies & delicious snacks, we are definitely gearing up for the new school year. 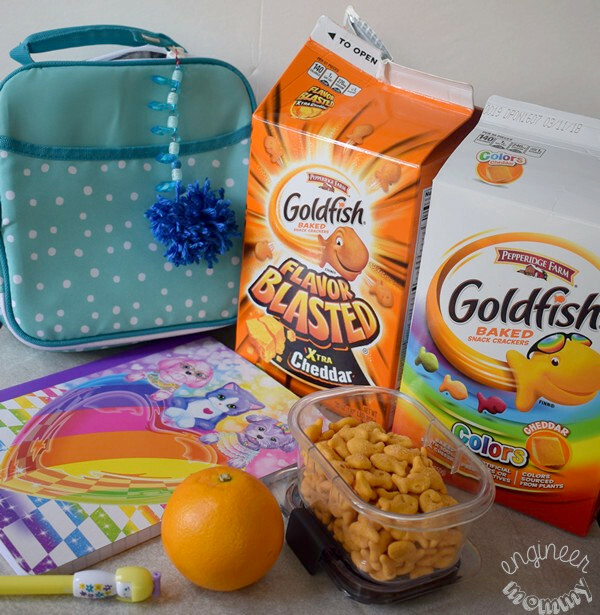 Goldfish® crackers are such a wholesome snack that is perfect for those after-school munchies! 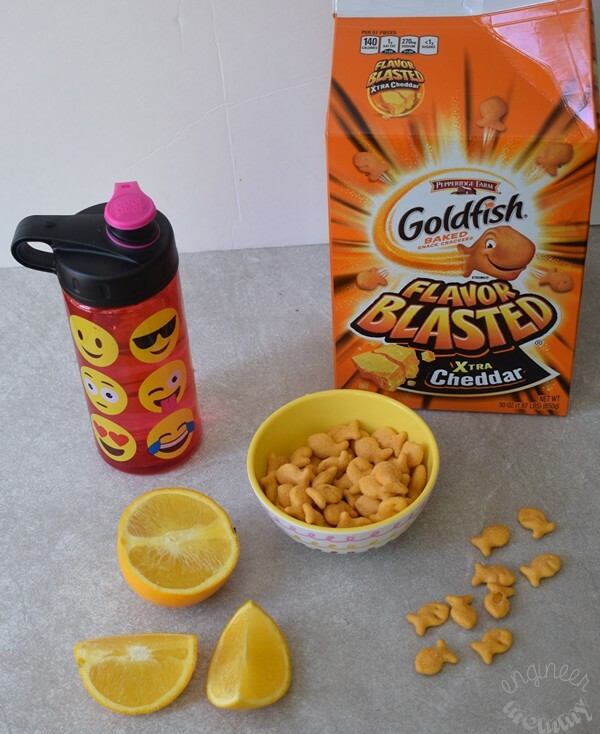 In fact, one of my kid’s favorite snacks ever is a small bowl of Goldfish® crackers and an orange (her favorite fruit of all time). Goldfish® crackers are definitely inspiring smiles in kids… one smile at a time! With snacks like these on hand, I am turning snack time into smile time. Look for Goldfish® crackers at your local Walmart store. 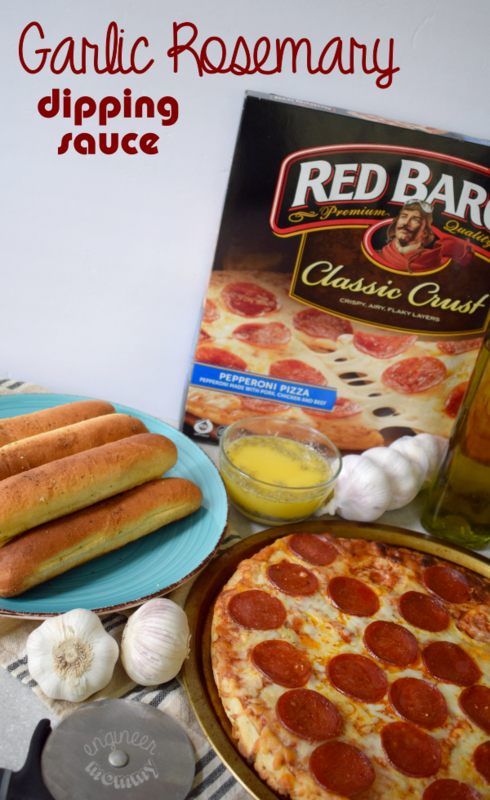 Don’t forget to take advantage of the current rollback pricing of $5.98. Try the snack that inspires smiles. The Snack That Smiles Back®. 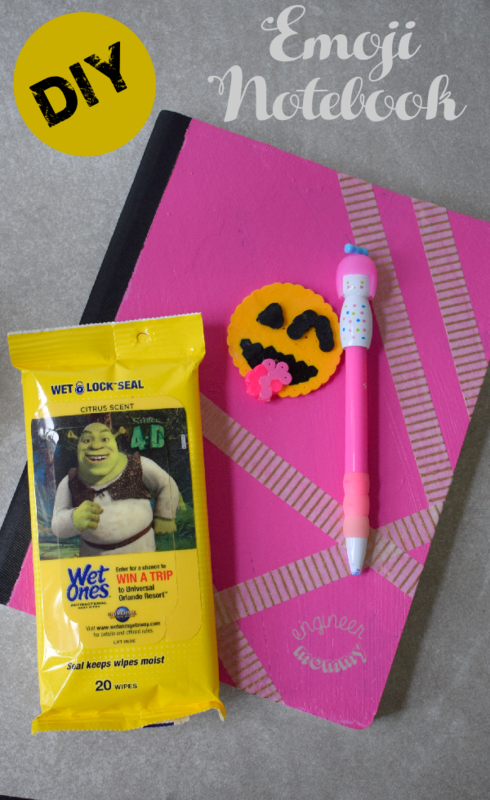 Are you working on any back-to-school crafts? Are Goldfish® crackers one of your kid’s favorite snacks? That charm is just the cutest ever and really sets a lunch box apart from all the others since there’s bound to be a couple of lunchboxes that look alike. I love how easy it is to make. Adorable! What a gorgeous charm I am sure your daughter will cherish it and those snacks looks absolutely tasty. What a fun way to make a packed lunch even more special. It would be really fun if you could create a different lunchbox charm for each holiday! That is such a cute idea and it looks like your daughter loves it! You are definitely more creative than I am. That is a really adorable. 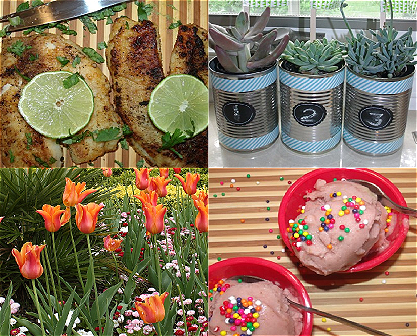 What a great DIY to do with the kids before they head back to school. I wish I had a little girl so I could make this! I used to have phone charms when I was in my 20s! 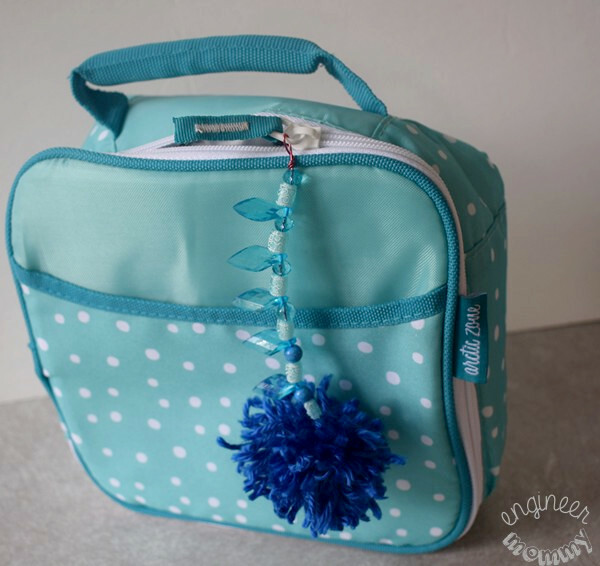 Oh how cute is that lunch box charm what a lovely idea for kids to even make there own for the boxes! Oh, that is so cute! My daughter used to make something similar for her back pack zipper. I’m sure that your daughter gets lots of compliments! I can see all the girls wanting to make lunch box charms and how fun and different all of them would be. These are so cute. I bet kids will love them! I didn’t even know lunch box charms were a thing. How cute! And I could totally eat that whole box of goldfish! What a cute back-to-school project! 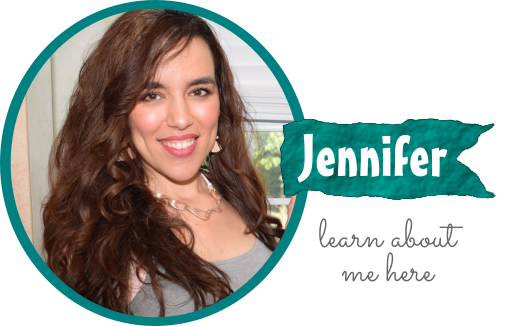 Sounds like you have the essentials covered. My kids love Goldfish and we always get those big boxes! Oh what a cute little charm! And it is so easy to make. I think my little niece who is starting Kindergarten this year will love to have this. Well, of course, and the Goldfish crackers too. Your charms are adorable! These poofs are definitely all the rage with girls my daughters age so we will give these a try! My girl would LOVE to make these. 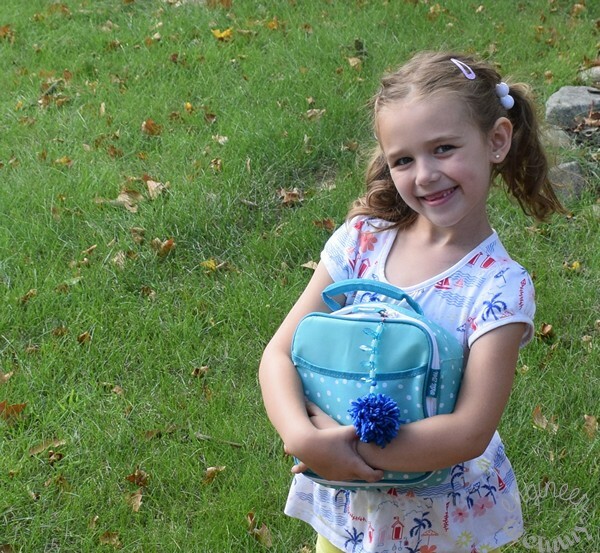 She’s a little crafter and loves sprucing up her school items. I’ve never heard of lunch box charms before but that is adorable! Those beads were really unique. I can see this becoming a fad. I bet you’ll find yourself making more for all your daughters’ friends! Love this idea! Such a great way of adding personality to a lunch box. And is that a Lisa Frank notebook?? I’m overcome with nostalgia from my childhood! I like the DIY Lunchbox Charms. It looks beautiful.